When you think of ceramics at a Retail Garden Centre, you’re probably imagining a display of pots and planters – and we do stock a great range of both. But don’t forget to pay a visit to the quietest corner of the centre, as well as strolling among the stunning displays of flowers and trees outside. There is no part of Waterfall Wilds that has not been touched by the beauty of gardening – and that includes the restrooms. Stunning basins in the shape of some of our favourite flowers are certain to brighten up your day, and just washing your hands here contributes to sustainable gardening. All the grey water is of course repurposed for irrigation outside. Men are in for a particular floral treat when they spend a penny – and no, we don’t mean the air freshener. 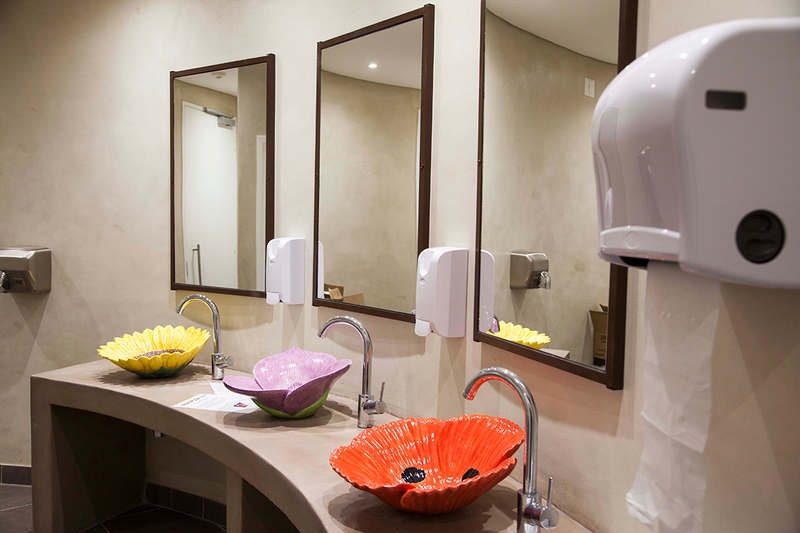 Ladies, for the first time ever, it’s worth knocking on the door and taking a peek inside the little boys’ room if no-one’s there – who says a urinal can’t be a thing of beauty?! Although we did resist commissioning one in the shape of a peony!